I am charmed by this because I know that birds coming into the home spells excellent feng shui. Indeed, birds have been sharing my house for a long time. This started years ago when a pair of mynahs started living in the eaves of my home at the back. Over the years, this has expanded into a Mynah community and we hear them each morning making loud chirpy sounds. They are a noisy and aggressive bunch but I am happy to share my home with them. I have always known that BIRDS bring opportunities for advancement, that they convey cosmic messages from the Gods, that they even bring wealth and unexpected developments in one’s life, and I have always rather liked the strident handsome appearance of the Mynahs with their yellow beaks and sharp eyes. They feed on the worms in my garden and catch lizards from the walls. They also share dog food pellets with my American Goldens. That they are happily reproducing in my backyard has brought good fortune and yang chi for us, so I regard them as part of my family. Now a smaller, gentler variety of birds has started coming to nest in the potted palms that grow profusely in my patios and outdoor verandahs. 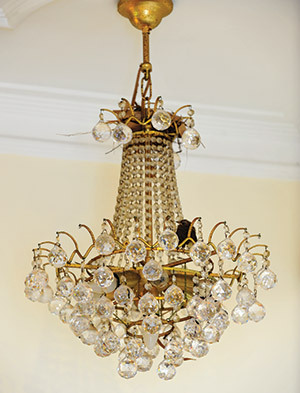 More recently, we spied several pairs at both the front and sides of my home, but this is the first time a bird has gone so far as to build a nest right inside my living room, on a chandelier no less. The bird flies in and out of the house using different windows each time. It took a week for the nest to get built, then another week for the egg to be laid… a fortnight later we started seeing the baby bird… it was amazing watching mother bird feed baby bird over a period of ten days. At nights, the baby bird sleeps alone in the nest and early morning the parents return with breakfast, and then lunch and dinner. And even as we look at them fascinated, they stare back at us… oblivious to all the sounds we are making. Their presence is reassuring and gives us all a warm feeling. I have no doubt they bring goodwill messages from the heavenly Phoenixes, for this past month has been a very special and lovely time for me. I successfully completed a very special Buddhist meditation Retreat with a dozen friends. It was an amazing week for us and I returned home rejuvenated, feeling very light and happy. Birds in general always spell good fortune and when you share your home with birds without you having to keep them in captivity, they always bring some special good fortune. When you cannot have the real thing however, images of birds can be just as effective in bringing good feng shui. The mythical Phoenix is the most famous bird in feng shui. It is usually paired with the Dragon as a feng shui symbol of marital happiness. On its own, the Phoenix is Yang, but when paired with a Dragon it is Yin. The Phoenix represents a time of good harvests, big profits and great happiness. This is the winged creature that has immortal and heavenly status. The Phoenix symbolizes strength, resilience and perfect transformation. 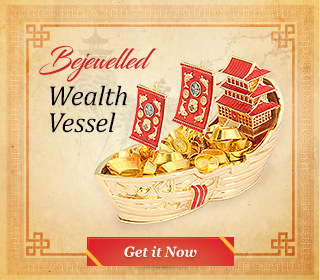 The Phoenix also signifies rising triumphant just when you think it has passed on… having a Phoenix or even better 9 Phoenixes in a golden screen brings amazing opportunities which come continuously; and it takes residents into new heights of attainments. In feng shui, the Phoenix is associated with the element of Fire; its direction is South, and it brings transformational change. Next to the Phoenix in popularity is the elegant Crane, which signifies longevity and eternal love. Images of flocks of Cranes with red beaks feature prominently on feng shui inspired vases, embroidered items, pieces of clothing, decor items and even in fine art. According to ancient Chinese legends, Cranes carry the Spirit of the departed to the heavens. Thus, the Crane is often used in feng shui to signify the energy of a long, noble and peaceful life that is eventually taken to heavens. The love birds that feng shui recommends for those wanting to find a mate are the Mandarin Ducks. These birds mate for life, so they have come to symbolize devotion, fidelity and lifelong affection. To enhance romance, mandarin ducks are always displayed in pairs and placed in the Southwest corners of frequently used rooms. The brilliantly plumaged Peacock is the equivalent of the Phoenix who lives on Earth. Its mesmerizing colours and the “thousand eyes” look enhances popularity and recognition. The peacock also symbolizes beauty and love. Images of peacock are extremely auspicious, bringing wealth and prosperity, while peacock feathers assist the lovelorn to find and keep love. The practical and disciplined Rooster is often used in feng shui to improve professional mobility and for career advancement. Roosters placed in the office reduce gossip and backbiting thus making for a better environment. Meanwhile, the Magpie in feng shui is associated with joyousness. This bird sings beautifully and is usually associated with marriage or having a baby – it magnifies the nesting instincts of those slow to wed or find a mate. Magpies signify love and marriage. Mothers keen to see their children happily married can use the magpie as a wonderful enhancer. In China, whenever magpies come to your home, it is said to signify an auspicious omen. 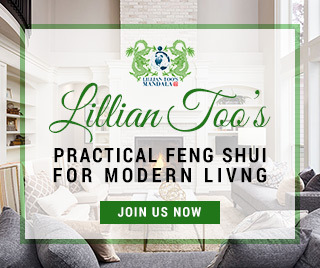 It brings new opportunities and this can come as feng shui cure to help remove or alleviate obstacles in one’s career or love life. Finally of course we must not forget the Dove, the universal symbol of peace and purity of motivation. It is always beneficial to invite into the home the energy of auspicious birds. You can select the kind of birds that thrill and please you. And bird images can come as a photograph, a painting, a small sculpture or a vase, a pot or anything at all showing happy birds, and especially 100 happy birds. 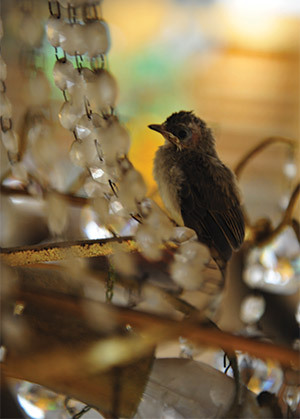 Placed in your living room or work area, the energy of auspicious birds brings warm feelings of love. They lighten the air, and for those working from home, bird images give you a clarity of concentration that raises your productivity amazingly. As someone totally mindful of the multiple benefits that birds bring, you can understand then how thrilled I was when a beautiful baby bird was born inside my home! I interpret this as a definite sign that we will soon welcome a new baby into the family, and this can take any form – it may be a new project, or a fresh new perspective; I await the forthcoming good fortune approaching with open arms!